Thoughts on being a professional School Counselor. This has been a busy week. I moved back into my office after spending the summer in a temporary office in the elementary school due to the renovations to our building, met with and scheduled all of our new students, made many last minute changes to our master schedule, went to many meetings and today, welcomed students back for the new school year. It's now Friday night and I am tired. Exhausted, however, is probably a better word. This is also my 21st year as a school counselor. I can still feel overwhelmed at times. I had lines of parents and teachers out my door and down the hallway. I had at one point 27 phone messages and about 100 emails to answer (and yes, that was in one day). I am almost embarrassed to say this, but asI was ready to leave tonight,my phone message light was blinking, letting me know I had yet more calls to return. But at 6:00 tonight, I packed my three boys up and went home; calls unanswered. When I first started this blog, I never knew it would, in just over 6 months, have reached so many people. I never thought people from all over the world would be reading what I did in my day, and definitely never thought so many readers would email asking for advice. I am honored by your responses, and feel very strongly that I share with everyone what I have learned in my 21 years as a Professional School Counselor. Now normally, I do a secret eye roll when people add the word professional in front of our title, School Counselor. I believe it to be redundant. Why would anyone think we would were anything less than professional? Besides, we don't say professional teacher, professional dentist, professional administrator, professional chemist, etc. As I reflect back on this week, it's important for me to remind everyone, that we are professional. As much as I worried about certain students this week, or stressed about to having a schedule not quite right, or was angered by having to change the master schedule, yet again and with less than 24 hours until the start of school, it was important for me to remember that I am a professional. 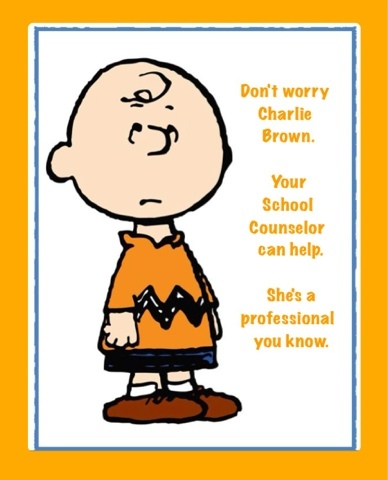 For those of you just starting your School Counseling Career, professional, comes before school counselor for a reason. That means you need to know when to step back from a situation, and not get sucked in. It means as much as you care about kids, to remember that you are not their buddy. You are the adult who cares about them, advocates for them, defends them, listens to them, roots for them, congratulates them, believes in them, and loves them. You must wear your professional cape into the community, be it on school grounds or off. You are a model for empathy and kindness, caring and compassion, knowledge and wisdom. You speak truths, and remain calm. You teach, you lead, you inspire, you challenge, you learn. You have a role that is defined, but it is how you emulate that definition that will result in the counselor you become and the counselor that others believe you to be. How do you keep it all together? How after 21 years, do you still love what you do? How do you create a definition of what a school counselor is, does, acts, and is received? I think the answer is easy. Take the best parts of who you are and capitalize those strengths. Commit to learning something new every year, take risks, and be a professional. Since I already listed many things to do, let me also list some things that should be a big DON'T in your career. 2) Don't email students using a personal email. If you must email them, email both the student and their parent. Use a program like Naviance or Remind 101 to send reminders that are "business-like" and not "personal" in nature. 3) Don't "friend" your students on Facebook. 4) Don't give students your cell phone or home phone number. 5) Don't give students rides in your own car. 6) Don't take students to appointments. 7) Don't rescue your students and take them home. 8) Don't be a buddy. With all this being said, I wish everyone a great school year. Get out there and help make a difference in the lives of those students with whom you work. Help those that are in need, as well as those who don't show need, but silently need the help as well. Spread happiness, show kindness, and love life. I hope you leave for work each morning eager to get started, and leave for home looking forward to another day. Remember that not each day will be perfect, but your reaction to it will set the stage for whether it will get better or get worse. Have a great year School Counselor, and be Professional. How do you put professionalism in school counseling?